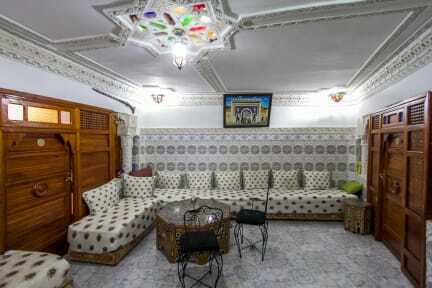 Pension Kawtar is a traditional and hospitable Moroccan hotel in the heart of Fez medina. Tucked amongst the bustling streets of the old city, Pension Kawtar is an oasis to travelers and backpackers from around the world. Pension Kawtar is in a quiet location, yet only footsteps away from the ancient main street of Taala Saghira. 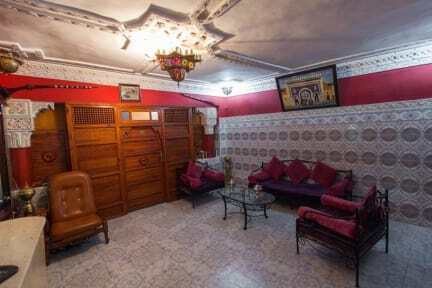 Easy to find and centrally located, Pension Kawtar is walking distance to all the major sites, cuisines, and souks of Fez El Bali: the old city. Our terrace is a place of private relaxation where you can enjoy the breeze and a panoramic view of the mountains and ruins around the city. Our staff is comprised of friendly and hospitable locals dedicated to making your stay in Fez both memorable and enjoyable. These are only some of the experiences available to you at Pension Kawtar.